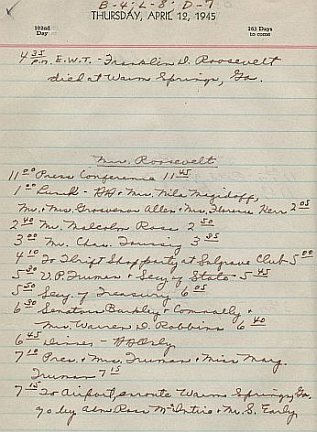 On April 12, 1945, President Roosevelt died after suffering a cerebral hemorrhage in Warm Springs, Georgia. Three days later, after his body briefly was returned to Washington, he was buried at his Hudson River estate in Hyde Park, New York. By prior agreement among the Allies, the Russians were allowed to begin the final attack of the European war leading to the Fall of Berlin. Hitler committed suicide in his bunker on April 30, along with his long-time mistress Eva Braun whom he had married the day before. After stiff fighting, the remaining German resistance in Berlin ended on May 2. On May 7, General Alfred Jodl, representing the German government, signed the act of military surrender in the war room of the Allied headquarters in Reims, France, that provided for fighting to stop at 11:01 a.m. on May 9. The general surrender was formally ratified the next day in Berlin with German Field Marshal Wilhelm Keitel signing an identical document for Soviet General Georgi Zhukov, fixing the official end of Germany’s war with the Allies. ...In the course of the last four months it has been made probable--through the work of Joliot in France as well as Fermi and Szilard in America--that it may become possible to set up a nuclear chain reaction in a large mass of uranium, by which vast amounts of power and large quantities of new radium-like elements would be generated. Now it appears almost certain that this could be achieved in the immediate future. That first cabinet meeting was short, and when it adjourned, the members rose silently and made their way from the room--except for Secretary Stimson. He asked to speak to me about a most urgent matter. Stimson told me that he wanted me to know about an immense project that was underway--a project looking to the development of a new explosive of almost unbelievable destructive power. That was all he felt free to say at the time, and his statement left me puzzled. It was the first bit of information that had come to me about the atomic bomb, but he gave me no details.... The next day Jimmy Byrnes, who until shortly before had been Director of War Mobilization for President Roosevelt, came to see me, and even he told me a few details, though with great solemnity he said that we were perfecting an explosive great enough to destroy the whole world. ﻿Stimson later followed up with a much more extensive session at the White House on April 25 at which he gave the President a memorandum projecting that the bomb would be ready for use within four months and suggesting that a committee be created to review the options for its possible use. Soon, with the surrender of Germany in May, any fear that Nazi atomic research would produce a weapon before the U.S. could develop its own bomb was removed. But in light of the heavy casualties American forces had suffered as they took back the islands close to the Japanese homeland, as well as sharply higher estimates from new intelligence reports of projected losses from an invasion of Japan itself, the option of atomic weapons in helping to end the War received serious consideration. ﻿Despite the recommendation, there continued to be debate within the government, as well as among the scientists working on the bomb's development, over the moral and military issues relating to its use. Leo Szilard, the physicist whose work led to Einstein's contacts to Roosevelt, argued for restraint in the use of the weapon. In March, Szilard drafted another letter for Einstein to send to Roosevelt asking the President to hear Szilard's concerns, but the letter failed to reach Roosevelt prior to his death on April 12. Szilard also attempted to organize support from other scientists urging that the U.S. not act alone in the use of the weapons. On June 27, Undersecretary of the Navy Ralph A. Bard wrote to Secretary of War Stimson that use of the bomb without warning was contrary to "the position of the United States as a great humanitarian nation," especially since Japan seemed close to surrender. Others argued, however, that the Japanese military, as illustrated by the suicide kamikaze campaigns launched late in the war against U.S. ships, would never accept a surrender. On July 16, 1945, the first atomic bomb was successfully tested at the Trinity site near Los Alamos. The blast knocked men down 10,000 yards away and was visible for more than 200 miles. 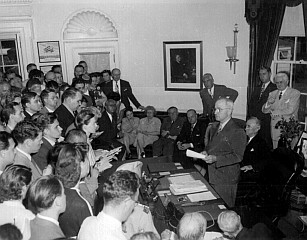 ﻿ ﻿On the day following the successful test, Leo Szilard traveled to Washington to deliver, through Secretary Stimson, a petition to President Truman from himself and 69 others working on the bomb program arguing that Japan be given an opportunity to surrender and that any decision to use the bomb "...ought not to be made at any time without seriously considering the moral responsibilities which are involved." It is unclear whether either Stimson or the President actually saw the petition left with one of Stimson's aides. ﻿ At the time of the test, President Truman was in Europe meeting with Stalin and Churchill at the Potsdam Conference. In separate private meetings, he advised them of the results of the test. Stalin gave no apparent reaction, but later reports disclosed that after he returned to Moscow he directed Soviet scientists to expedite their own nuclear research. The Potsdam Proclamation issued by the United States, China, and Great Britain on July 26 called for Japan's immediate unconditional surrender. The alternative, the allies warned, was "complete and utter destruction." Three days later, Japan rejected the ultimatum. ﻿...I called a meeting of the Secretary of State, Mr. Byrnes, the Secretary of War, Mr. Stimson, Admiral Leahy, General Marshall, General Eisenhower, Admiral King and some others, to discuss what should be done with this awful weapon. I asked General Marshall what it would cost in lives to land on the Tokyo plain and other places in Japan. It was his opinion that such an invasion would cost at a minimum one quarter of a million casualties, and might cost as much as a million, on the American side alone, with an equal number of the enemy. The other military and naval men present agreed. I asked Secretary Stimson which cities in Japan were devoted exclusively to war production. He promptly named Hiroshima and Nagasaki, among others. Three days later, a more powerful bomb was dropped on Nagasaki. 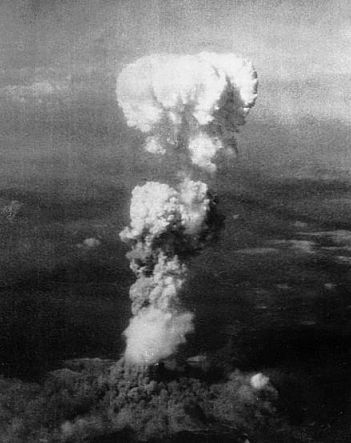 Subsequent studies have estimated the deaths occurring as a result of the bombings either immediately or through radiation exposure as ranging between 90,000 to 140,000 of Hiroshima's then population of 310,000 and 60,000 to 80,000 of Nagasaki's population of 250,000. On the day after the bombing of Nagasaki, the Japanese government offered to surrender on the condition that the role of the Emperor be maintained. After further exchanges between the State Department and the Japanese government, Japan agreed to an unconditional surrender on August 15, 1945, bringing an end to World War II. In addition to the six million Jews and other civilians who died in the Holocaust, total estimates of deaths attributable to the war for military and civilian casualties have ranged upward to 60 million.